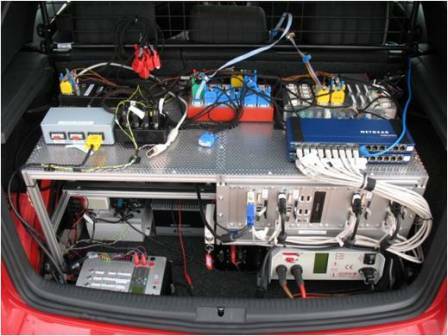 EMIC developed cost-efficient collision mitigation systems. These systems have mitigated the collision by emergency braking and steering based on frontal surround perception. A high penetration rate shall be achieved by means of low cost system architectures or low cost additions to existing assistance systems. EMIC have advanced existing concepts for collision mitigation with specific attention to the vehicle architecture and to cost-effective hardware and software components. 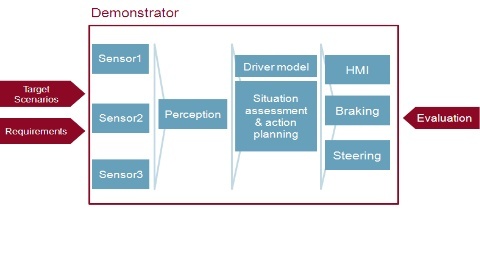 A driver model has been developed and implemented into the collision mitigation system in order to improve the warning and intervention strategy. EMIC equiped two demonstrator vehicles. Testing mitigation functions at ï¿½VeHILï¿½ indoor testing facility, in Helmond (Nethï¿½erlands) in September 2012. Two demonstrator vehicles, a Volkswagen Golf and a Volkswagen Passat, have been equipped with the required hardware components (environment sensors, control units, and HMI hardware). The Collision Mitigation System with a focus on cost-efficient sensors in the VW Golf. The Emergency Steer Assist using a stereo vision system in the VW Passat. During the following months, the baseline driver model for the Collision Mitigation System have been extended. Furthermore, the sub-project ï¿½EMICï¿½ have focused on performing development tests to finalize the function development. The final system specification and architecture for the two planned demonstrator vehicles were defined and described in the deliverable "System architecture and updated specifications". The two vehicles, a VW Golf and a VW Passat were delivered. Both vehicles were in the workshop for equipment with the required components. The development of the functions, namely the collision mitigation system with a focus on cost-efficient sensors and algorithm approach, and the driver model has started. Together with the respective sub-project the IWI strategies for each demonstrator were defined in a written paper. Also, the preparation of the test plan and the definition of the test scenarios has started.